A Year of Being Here: Kerry Hardie: "May"
lain down in the meadow, forgetting to feed. The horses swishing their tails. All hardship, hunger, treachery of winter forgotten. This unfounded conviction: forgiveness, hope. "May" by Kerry Hardie, from A Furious Place (Gallery Books, 1997). Text as posted on Jelisava. 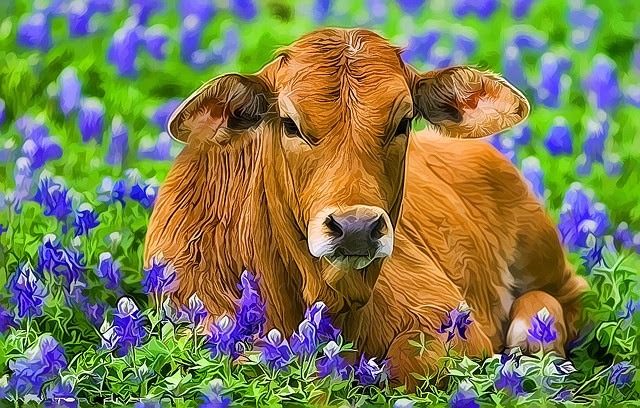 Art credit: "Cow in Flowers," photograph taken on July 24, 2009, by Bob.